There is perhaps nothing more irritating for a homeowner than to discover a leaking pipe. 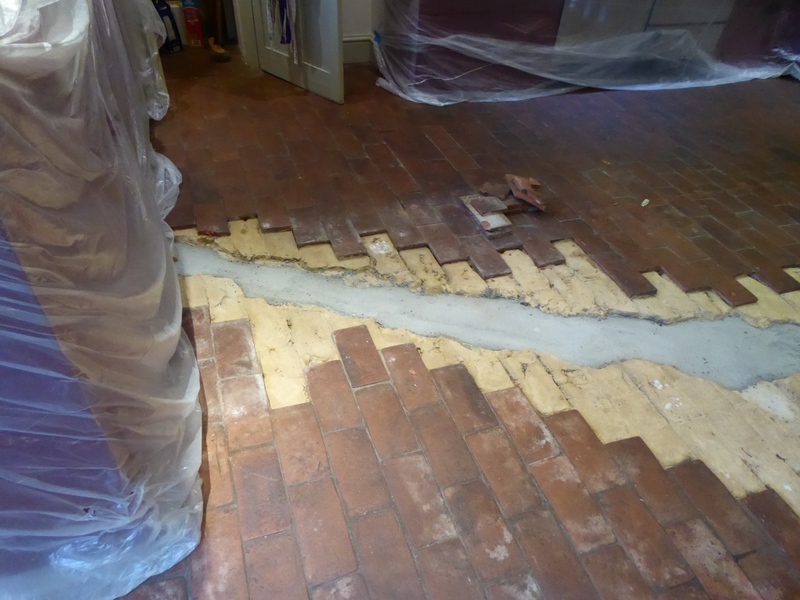 Even worse still is when that leak occurs underneath a natural stone floor! This recent customer of mine, who lives in Croydon, had unfortunately discovered a leaking pipe underneath her Quarry tiled kitchen floor. The plumbers had dug a trench in the floor to replace the pipe and fix the problem. As you can see in the photos below, the original tiles were not replaced and the entire floor was generally left in a bit of a mess. The customer had been trying to find a professional company to restore the floor, but her insurance company would only agree to sending normal cleaning companies to the job. Given the reality of the situation, you won’t be surprised to know that these companies all politely refused! 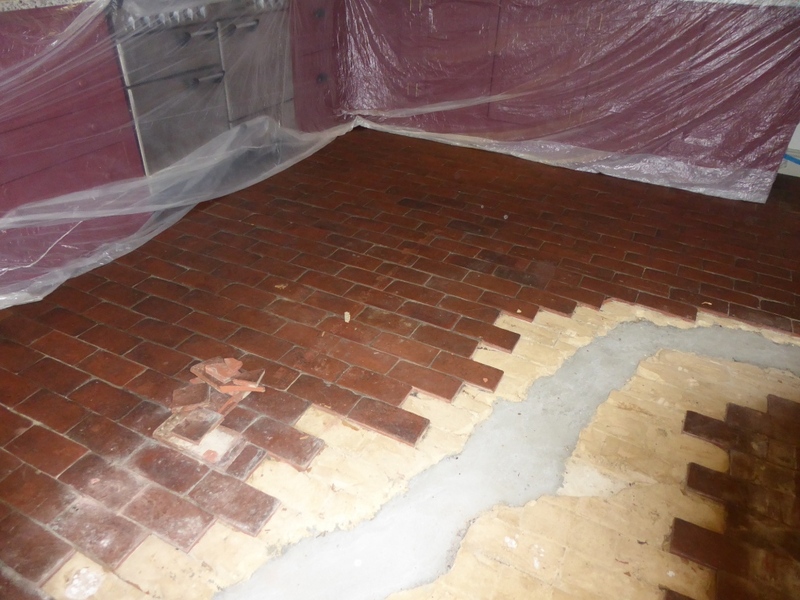 The situation went unresolved for over six months before the customer finally decided to contact Tile Doctor to restore the floor. The restoration took place over the space of six days. 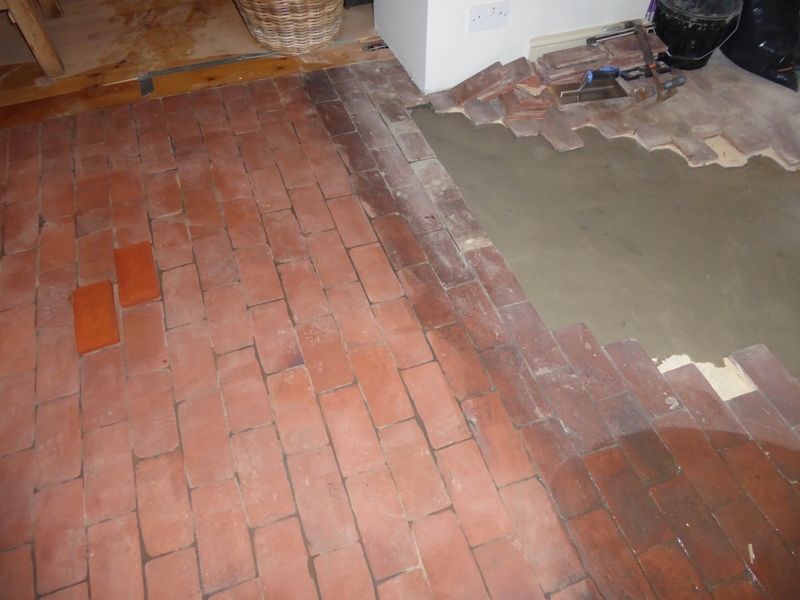 Our first port of call was to replace the tiles that had been removed as part of the plumbing work. 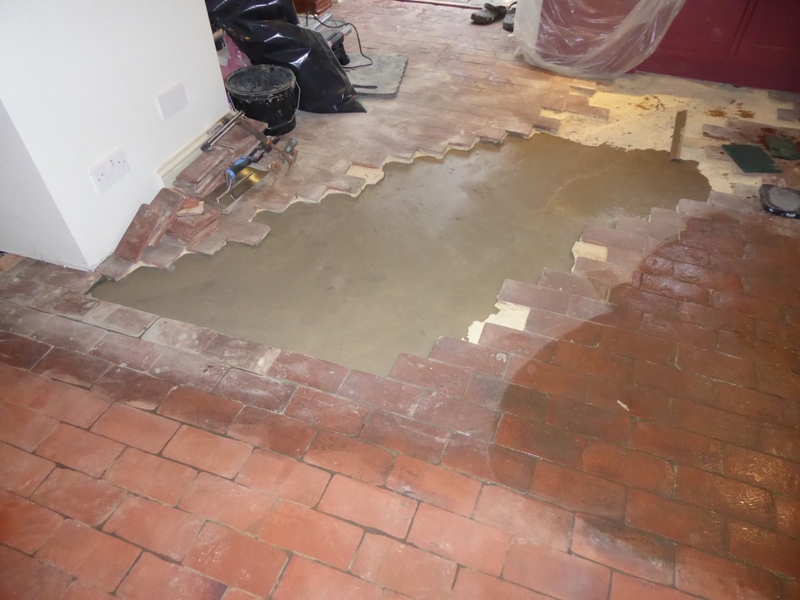 This wasn’t the easiest process as we had to level up the floor before the tiles could be replaced. Making matters more complicated, the tiles were all hand-made, and it was a bit like completing a jigsaw to avoid lippage. Lippage – for those unfamiliar with the term – means when a floor is laid unevenly and it can make walking on it hazardous. Once the tiles were reinstalled, it was time to give the whole floor a deep clean. For this, we used Tile Doctor Oxy Gel, leaving it to dwell on the surface for around ten minutes, before scrubbing it into the stone in combination with hot water. Oxy Gel is a strong, alkaline-based cleaner which works effectively to break down dirt and grime, as well as old sealers and waxes. 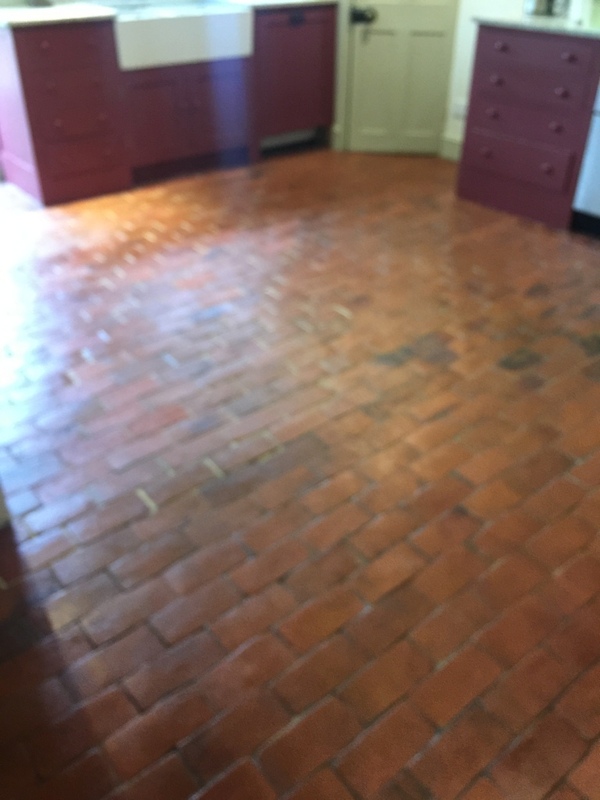 The next stage of the restoration was to rinse the floor with fresh water, and then lay down Tile Doctor Acid Gel for 15 minutes. Acid Gel is a blend of phosphoric and hydrochloric acids in gel form which is used to neutralise any grout haze and efflorescence on the tiles. After completing the deep cleaning process, we rinsed the floor again with fresh water and then left it to dry for three days. 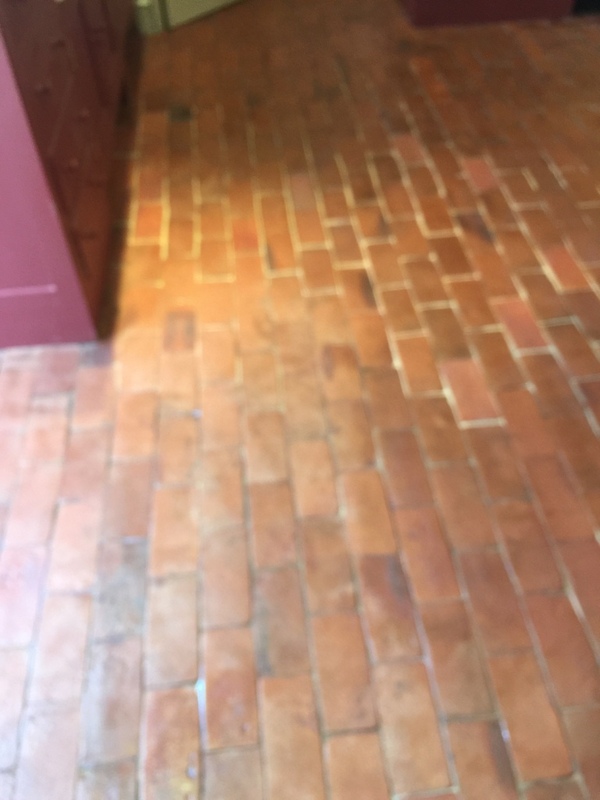 Giving the floor enough time to dry was important, since any excess moisture would not have allowed us to complete the restoration by sealing the tiles. After a few days, however, the floor was indeed thoroughly dried and could receive a fresh seal. We sealed the floor using five coats of Tile Doctor Seal and Go, a topical sealer which eliminates traditional two-step sealing methods. What this means is that it provides both a robust surface seal and a high-quality low sheen finish – in one product. After six months of difficulty and disruption, the customer was very happy to have her Quarry floor completely restored in just six days. Check out the photos below to see the outcome.